Well, the day finally came. The day (actually, about two weeks) that we’ve been waiting for. The Pool was finally resurfaced. I am keeping Pool capitalized because it was just That Important. Our entire spring and summer DIY projects were all centered around this moment. It felt like expecting a baby–all this prep and remodeling everything in the backyard for the big arrival. First, a guy came out on a Friday morning to drain The Pool. The company asked us to keep gates unlocked and remove the pool fence, which we did. We also realized that our backyard looks sooooo much better without a pool fence around it. Dang kids. Oh well, safety first! He hooked a hose to a pump and ran it into our sewer in the front yard. Took about a day to drain the whole thing. I should mention that I found a notice on my front door from the city, informing me that they came out and inspected my sewer and found it was in perfect working order. I guess that volume of water being drained raises red flags. I couldn’t wait to come home from work and see The Pool after it was drained! Here are some pics. Looked like a ghetto motel pool, IMHO. We inspected the bowels of the deep end and were disgusted by what we found. You never really can see what lies beneath, in the deep end especially. Yeesh. Embarrassing. Side note: our pool serviceperson is awesome. She totally and genuinely cares about customers and their pools. We have had her service the pool weekly for the last 12 years. She is so patient with us when we “forget” (or laze out) of performing routine maintenance on The Pool. She told us many times we need to empty the sweep regularly, especially because of the big ol’ tree in the neighbor’s yard that sheds all sorts of debris into The Pool. She also told us to regularly brush the pool (did it once in 12 years). She also declined to recommend any plastering companies, because she didn’t want to feel responsible if the deal went south. She said many companies give kick-backs to service people if they recommend their business, but she doesn’t want any part of that. Like I said, she’s awesome. Anyway, she knows pool care inside and out, and is protective of “her” pools. When The Pool was stripped to the substrate, she noticed the broken rebar sticking out of the hole. She asked if they told us what the plan was for them. She was worried it would rust the new plaster over time. My husband asked the workers, and they said they spray with yellow….stuff…that prevents rusting, then plaster over it. Our pool serviceperson reluctantly agreed this was ok, but again, she only wants to make sure our pool (her pool) is up to par. Ok, back to the Naked Pool. It was weird- lumpy and ridge-y. I was wondering how they’d plaster over it. Next came the tile. That also took about a day for them to remove the old, 80’s, stained (I told you we didn’t brush the pool) tile. Don’t let the screen door hit ya, tile! When I came home from work, I felt like I was gazing at a newborn when I saw the new tile! It matched our newly remodeled yard perfectly! We discovered the company grouted over the filling hole–the hole that when we turn the faucet, it fills the pool. We sorta need that. So hubby called them back and they chiseled out the majority of it for us. We also didn’t hear anything about our pool lights we asked for. We called again, and they sent the electric guy out. We got two new LED lights. We had the choice of colored or white lights, but we chinced out at went with the cheaper white lights. Then came the day of plaster. This was about a week and a half after The Pool was drained. I had hubby send photos to me throughout the day because I was so anxious! When I saw the photos I was worried the color was too gray. We chose the Diamond-Brite finish, and had originally wanted a darker color We told the company we wanted “Midnight Blue”. The owner warned us about it- he said some customers were not happy with the outcome, because they said their pools ended up looking like a “Dough-Boy” pool, especially in smaller pools. Plus, the Midnight Blue was significantly more expensive. So, we went with “Manzanillo Medium”, which was a bright teal/cobalt color. Anywho, when the plastering was being done I thought it looked too gray. But I knew when it would be filled it would look different, so I didn’t get too hyper over it. As long as the 80’s blue was gone. So I didn’t know this, but filling The Pool can happen right after plastering. What I did not know, was that one should not wander through a recently-plastered pool while it’s filling. Sure, the instructions said for no one to get the pool for about 10 days after plastering, but I assumed that meant swimming. So here’s what happened to Amanda. I got home from work and noticed The Pool was filling, and the floor return covers were left off from the plasterers. They did not tell us if this was intentional or not. We tried to call, text, and email the company to find out, but it was after 5 pm. No answer. It would be hard to replace them after the pool was filled, and I was freaking out! Screwing them in underwater? No way! So we called our pool serviceperson. Left a message, and she called back immediately. I was already in the filling pool trying to get it on. The damn thing would not go on right-the cap screws on and regular screw hold it in place. I heard my husband tell our pool serviceperson “Yeah…Amanda’s in The Pool”….then to me: “She said get out of the pool right away!” So I hustled out. The reason why people should not go into a newly plastered pool as it’s filling is because if your feet get wet, and you walk on the plaster, it leaves a perfect footprint that will remain on the plaster for all eternity. I was devastated. We spent $11,000 on this remodel, and I ruined it on the first day. Our pool lady came by to look at everything that same evening, but I was too ashamed to show my face. My husband said she told him not to worry about it. It gives it character. A great big ol’ footprint. NOTE: Once the pool was completely filled, the footprints disappeared. YAY!! Another note: We called the pool company the following Monday, and they said the floor return covers were left off intentionally. They tend to leave black rings as the plaster cures. Would’ve been nice to know before I almost ruined an $11,000 project. Anywho, The Pool was filling via a garden hose. It was actually a calculated system, this pool filling process. I assumed we would just turn on the faucet and it would fill. Nope. The garden hose has to sit on the bottom of The Pool. They attached an empty water bottle to the hose to keep it afloat as it filled. The reason is so that it would not rest on the bottom or against the sides and mar the plaster. The splashing from the pool fill hole would also mar the plaster. So the hose ran for about 19 hours before The Pool was completely filled. Have not yet received my water bill. However, I like what it looked like so far! Looks kinda like Lake Louise…. We were eager to test the lights once the pool was filled. Lo and behold, they did not work. We emailed the company and they told us they left off the pool light switch on the main breaker, because many people go and try to test the lights when the pool is empty–a big NO-NO! He told me to turn on the breaker and reset the CGFI or GFCI or whatever it’s called. Well, I have about 5 of them in my house, and not sure which one went to the lights. Naturally, I tried the one newly installed by the pool pump by the company’s electrician. But it did not work. Tried the rest of them in my house. Did not work. I sent a snarky email to the company the following day asking them to please come out and check it. We are not electricians, and I didn’t feel comfortable dinking around with electrical circuitry. They agreed, but of course Murphy’s Law dictates that when you ask the chemical guy to try it, it works immediately. Like literally, flipping-a-switch-immediately. We may not be electricians, but we are not stupid either. We did what we were told. Arghhh. OK, so lights work. Now: the Chemical Drama. We paid to have the company handle the startup for a month, which was a huge relief for our pool lady (but she still came by weekly, sometimes twice a week to check on “her” pool). We were responsible for brushing the plaster three times a day. This is to remove the dust from the plaster and push it towards the pump (which ran 24/7). The chemical guy came by every other day or so the first week after plastering. It looked good, only a little cloudy which I expected. One day we woke up and the pool was green. Green! Green like Emerald Bay in Lake Tahoe. Kinda pretty, but not normal. We called the chemical guy, who said he’d be back the next day. I had a coworker tell me it could be the heat causing the chemicals to get out of whack (we had temps over 100 degrees that week). So the guy came the following day, dumped in some chemicals, and reset the pump to run 8 hours instead of 24 hours. He said it didn’t need to run all the time at this point. My husband texted the pool lady and she said that wasn’t right, and came over to check it out. We turned the pump back on to run 24 hours. Finally, after 2 days, the color was back to normal. I did email the plastering company to let them know the company they subcontract out to let our pool turn green. Thought they should know, and I was a little peeved. Ok so finally, after 2 weeks of hiccups, worry, and brushing (a great workout, BTW) our Pool turned a beautiful, refreshing, crystal clear, BLUE sparkling oasis. The company did a great job with The Pool, despite the communication issues (not necessarily a surprise with contractors). We are very happy with the outcome. Ok- only three weeks left till my pool is resurfaced. The pool is the reason why we’ve gone all cray with other DIY projects in the back yard. Can’t have a beautiful new pool with an ugly backyard! The pool deck is done. The patio is done. Fire pit, planters, patio table: ready to go. Ugly worn out graying fence…..ugh. My fence was replaced about 10 years ago. I know nothing about fences, but I’m pretty sure it wasn’t sealed or stained. Now it is graying, dingy, and looks like it belongs at the Addam’s family residence. Of course, I hit Google and YouTube to figure out my options. Painting? Staining? Replace? Replacing was not an option- already have a huge pool project on the financial books. So, I decided to pressure wash first, then decide what to either paint or stain. Pressure washing was a huge P.I.T.A. I got through about 3 fence panels before I realized I wasn’t standing close enough to it, so I had to move in closer and start over. Pressure washing isn’t really washing- it strips the outer layer of dingy, dry, damaged wood, leaving the nice natural wood color. My Ryobi pressure washer (around $100 at Home Depot) came with a 15 degree tip, which was recommended for pressure washing fences and decks. I used that for the whole project, then later found I didn’t need to. A 25 degree works better and covers more area, but the 15 degree works better for tough to remove grit and grime. Ah well, what’s done is done (although it took longer). Tip: wear a hat and old clothes. The tutorials I saw warned against getting wet, but there was nothing I came across that warned of being pelted with soggy wood particles. Finally, finished power washing the whole backyard fence- after 2 days. Then we got stuck deciding on a color and finish. We actually really liked this lighter, natural wood color, but wanted to do something a little different. I LOVE the look of black-stained fences- it makes any greenery pop, and I thought it would make the pool color pop as well. However, we decided against it because 1) we thought it would make the yard look smaller and 2) we get direct sun almost the entire day in the backyard- it would be way too hot. Then we considered a basic brown, but then thought that would be too boring. 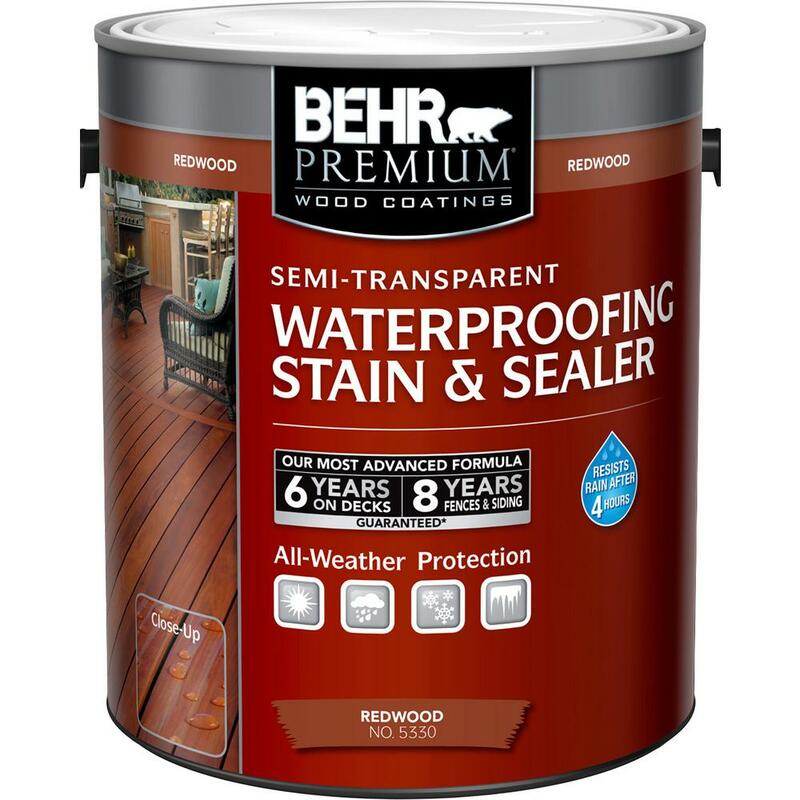 So we settled on Behr’s Semi-Transparent Wood Stain and Sealer in Redwood. And so, we painted on the stain. I tried to give our garden sprayer a second chance (see the previously reported debacle in my Patio Refinishing Project), which again, didn’t work. The tutorials I’d seen recommended spraying on over a small 3 foot-or-so area and then back rolling with a roller or pad, so thankfully we had pads and brushes! The stain is thin, and a little goes a long way (depending on the wood). Some areas actually sucked up more stain, but overall it went pretty smoothly and lightly. The pad worked the best. Tip: be sure to use a tarp to cover greenery at the fence line, or use a hoe to pull rock or bark away from the fence line. Along the way, my hubby and I named the long, straight, uninterrupted panel of the good neighbor fence the “good side”, and the other panels of the good neighbor fence (with the cross beams) the “crappy side”. We used the pads for any long, straight boards and brushes for shorter boards. We used a 2 inch brush to paint the sides of any boards that stuck out (hey- my fence is over 10 years old- some parts look like a row of crooked teeth). Tip: The painting was exciting and fun at first- until we got to the crappy side of the good-neighbor fence for the first time. Applying the stain to the very bottom was difficult. Use a smaller brush and knee pads! Use pads for the cross beams. It took us about a week to get the entire backyard fence painted- we worked several days during the week after work as well. It was hot though, so we took lots of water breaks. I’ve already started on the front yard fence too….. When I moved in to my house in 2005, I loved the kitchen layout. But I hated the décor. It had hideous dark blue floral wallpaper that was a huge fiasco to remove, soffit- type lighting (still there- working on getting rid of it), and dark, DARK cabinets. The kitchen itself is small, so the dark colors didn’t help. It wasn’t until 2015 that I decided I couldn’t live with the dark cabinets anymore. It was me or them. I googled various way to resurface cabinets, but had a heck of a time with a past cabinet project in which I had to sand them all. I wanted to find a way to resurface without sanding. Sanding wouldn’t be so bad, but my cabinets have tiny grooves in them that made it nearly impossible to penetrate with an electric sander or hand- held sandpaper. Plus I lacked the upper body strength to sand an ENTIRE KITCHEN! I considered chalk paint but was turned off by the waxing part of it for some reason. Chalk paint can be applied right over clean surfaces- no sanding! Again, I think the I was turned off by the waxing because of those dang tiny grooves- I don’t know, but I did come across a product at Home Depot- Rustoleum Cabinet Transformations. It can be tinted to various colors, and they have a light base and dark base depending on your color preference. I watched the instructional video on YouTube, and decided…I can do this! Basically you clean and degrease all surfaces, let dry, paint, let dry, apply glaze (if desired), let dry, then apply the protective top coat. The kit comes with a DVD, the cleaner/ degreaser, paint (you can tint to whichever color you choose), glaze, top coat, application cloths, green scrubbies, gloves, and paint stirrers. Tip: buy extra green scrubbies if you have a big project. I highly, HIGHLY recommend sketching a map of your kitchen/ project area to include each and every cabinet door, drawer, and cabinet. It’s been almost 2 years, and I still remember I had twenty-six items. I numbered them starting at the left of my kitchen and moving clock-wise on. Each number on my sketch corresponded to a cabinet or drawer. I removed the cabinetry and drawers as I went along 1) to prevent confusion and 2) due to space constraints. Each set of cabinetry I removed, I numbered with post-it notes. I numbered the same corresponding hinges (since I decided to keep the same ones) and placed a post-it with the number along with the hinges in Ziploc bags. I basically had two workshops going- the kitchen (cabinet bases) and the garage (cabinet doors and drawers). In the garage, I set up sawhorses with long pieces of plywood as a work surface, and placed the cabinet doors and drawers on them. In the kitchen, I tried to maintain some semblance of normalcy by trying to work in small areas so we could still use the kitchen. First, I set to work cleaning and degreasing. Wear gloves for this part. I cannot stress this enough- this step is the most critical part of the process. The surface must be thoroughly cleaned and degreased not only to be clean and degreased, but to dull/ remove the existing glaze on the old cabinetry. This will allow the paint to stick. So, be liberal with the degreaser, and scrub your heart out. Then scrub again. Be sure to get into each nook and cranny. For the cabinet units in the kitchen, take special care (and extra elbow grease!) around the stove area. For some reason I had grease all the way up the cabinets to the ceiling! After scrubbing, take a damp towel and wipe clean. If you see any suds or bubbles, keep wiping with the damp towel until clean. Then flip over the cabinet and do the other side. Since space was an issue, I put the post-it notes with the cabinet’s number on the wall in the garage and propped up the corresponding cleaned cabinet door beneath it. Then I got started on a new set. Then I worked in the kitchen, degreasing and cleaning the cabinet units (is that what they’re called??). Hubby did not help with this project as he was on Keep Kids Away From Project duty. It would definitely help to have two or more working on this project though. After letting it dry for the recommended amount of time, I got started painting. I first applied painter’s tape on the insides of the cabinets (I did not bother painting the insides), on the floor, walls, and ceiling around the cabinets. Since I was lazy, I didn’t remove everything from the cabinets unless the stuff extended over the paint tape line. We had the paint tinted to “Linen”, which is a cream-color. I used a paint brush for the painting, rollers are not recommended. Like I mentioned, I have tiny grooves in my cabinets, so I would apply the paint lightly around the grooves to prevent pooling. The painting was pretty straightforward. I went on cleanly and covered the dark wood beautifully. Just for my own added comfort, I applied 2 coats to every surface. I was about 4-5 days into the project by this point, mainly because of the recommended drying times. Next came the decorative glaze. I decided to use the glaze to give the cabinets some dimension. It’s a dark glaze that you paint on, then wipe off using the provided cloths. This creates a wood-grain look. Tip: buy extra cloths. I had trouble finding similar ones, but a close match would be first aid gauze. I must have looked suspicious in Walgreen’s buying boxes and boxes of gauze! You can adjust the look by the amount of glaze you remove- I removed quite a bit, to give a faint hint of depth. Because my cabinet faces have ridges and nooks, more of the glaze got stuck in there- but it gave it a nice “rustic”, country look. Tip: Apply the glaze to the back side of a cabinet first, to decide on the look you want. Then use it to match the cabinet units in the kitchen to ensure a uniform color. Throughout the project, take a step back and make sure the glaze matches. Honestly, after a while, it all blurs together. Consider getting a less exhausted pair of eyes! Another tip: make sure the cabinetry is COMPLETELY dry after painting- if not, when you use the rag to remove the glaze, you can remove the paint. This happened to me, and I had to paint over the spot, let dry again, and apply the glaze to try to match the surrounding surface. I had a hard time getting it to match 100%, but it’s ok- by garbage can is currently hiding it! Then let dry. This was about day 6-7 of the project. Then comes the protective top coat. Be careful with this step. You paint it on with a brush- watch for drips. It dries quickly so if it drips, you need to start over from the beginning. Unless you can live with the drip. The good news is that you can see where you have applied the top coat, so you can apply very lightly to help prevent drips. I have those dang ridges to contend with, so I used a foam brush to dab in corners, nook, and crannies. Worked beautifully. Now the fun part- putting everything back together! Thankfully, I kept track of each cabinet and drawer using my nerdy sketch and post-its. It was just a matter of hanging the cabinets. Easy Peasy! A note about this project: It has been almost two years since I completed it, and it has help up wonderfully. There are small scratches in 2 places- my utensil drawers. However, it does not look bad. I recently decided that I may change the color again, because we will be getting new countertops in the next year or two. I have a new theme I want for my kitchen! Also, it took about 10 days for me to finish this project. I started it when I had a week off from work. The length of time was mainly because it was just me doing the project, plus the drying times between steps. Overall, I am happy with the result and will probably use Rustoleum again. Now that the pool deck was resurfaced, I couldn’t turn a blind eye away from the crap-tacular concrete patio. I tried…I even bought a large outdoor area rug for a great deal at Ross ($27, thank you very much) to cover it and pretend it didn’t exist. But alas…it didn’t match the color scheme and in all honesty, it bugged me. So I pulled out the trusty iPad and I Googled. And Pinterested. And You-Tubed. I bought a magazine at Lowe’s that had an article about covering with pavers. I looked a little further into this, and found that 1) it was a little too expensive for what I wanted to spend and 2) it wouldn’t look right- the patio concrete runs right into a stamped concrete walkway- so it would end up being raised. Other options were to re-surface with concrete (like icing a cake), tiling, painting, or staining. I considered tiling, but the tiling job I had done in the past was not easy and after pricing supplies, I found it more expensive than I wanted. I decided on staining. In hindsight, painting might have been a better choice because there were cracks and chips that showed through the semi-transparent stain I used, but I liked the look of the stain better. I had an ambitious dream to stain the patio to look like “tiles”. Thanks, Pinterest! When prepping the pool deck for resurfacing (see my last post), I had already cleaned and etched the patio surface with Rustoleum Cleaner & Degreaser, then the Rustoleum Clean and Etch. I had a large crack in the concrete, as well as gouges that came from God-knows-where. I used a pre-mixed concrete crack filler to fill the crack, and the cement patcher to cover the gouges. The crack filler was easy to use- just apply into the crack. No need to trowel, according to the instructions, but I wanted to flatten it as much as possible so I used a putty knife (and my finger). The cement patcher was a little more laborious for me. Only because I’m a newbie. I added the water per the instructions, but I mixed it in the bucket it came in which was a pretty dumb idea. Note to self: use a bigger bucket in the future. When mixing, it splattered onto my patio and I had a hard time getting it thoroughly mixed. I used a paint stirrer, but something more sturdy would have been a lot easier. Regardless, I eventually got it mixed and spread over the gouges, and trowelled flat (well, as flat as possible). It dried quickly, which was good for my impatient soul. Then I sanded flat, and had my husband sand again. Now for the staining. In my head, I wanted to use the darker color stain first, then apply a lighter “highlight” color. After further research, I learned that the lighter stain should go first. Behr has numerous colors the stain can be tinted to- I wanted a stone/ tile/ southwest-looking color, so we chose the Behr Semi-Transparent Concrete Stain in “Saltillo”, and the darker color “Moroccan Dunes”. The images below look similar, but the “Saltillo” is actually pretty light, which you’ll see in the photos below. Next, I prepped the area. I bought some plastic sheeting to place over the surrounding areas as I planned to apply the stain with a sprayer. Then I was ready for the base coat. I had purchased a garden sprayer, because based on what I read online, it was preferred over a paint sprayer. The dude who works in the paint department at my local Home Depot said I can use any garden sprayer- so I bought a high-quality one. Note: make sure it has a fine mist option. You’ll find out why later. Mine did not. I put some of the stain into the sprayer, and pressurized it. I nervously started spraying. From what I saw online, using a circular motion while spraying created a stone-look. Mine looked like a paint-spatter-look, since I did not have a fine mist option on my sprayer. Hmmm. Good thing I though ahead, and had a paint roller waiting. I ended up back-rolling the paint and came out with a uniform base color (note the Saltillo appears lighter than the pic above). Then I had to wait 24 hours before taping. OK, here’s the terrifying part: taping out the design. I knew I wanted a border around the perimeter of the patio. I couldn’t find any 1/2 inch tape anywhere, so I ordered from Amazon. From what I understand, automotive stores may carry 1/2 inch tape for detailing. I found it easier to just order it. I measured 4 inches from the edge of the patio, and taped a straight-lined border. For the “tiles”, I wanted a diagonal layout. So I started in a corner and taped diagonally 18 inches apart. This was challenging- to keep the measurements uniform. I recommend having a second person helping and measuring with you. Also, make sure the tape adheres well to the concrete. Since I wanted a darker border, I started by using a nylon paint brush to paint the “Moroccan Dunes” around the border. I used two coats for this step. By this time, the sun was starting to go down, but I didn’t care. I wanted to git-er-dun. After the border dried, I poured the darker stain into the sprayer and got ready to spray it on. I guess I’m a DIY optimist, because for some reason I thought the sprayer would work this time. It did not. It looked like a murder scene, thanks to the reddish-brown stain we chose. Luckily, hubby was standing behind me and I sent him in to get another roller- a sponge-textured one (I wanted a stone-look, dangit!). I quick put the sponge roller on and it looked like Sponge Bob wandered through the afore-mentioned murder scene. Plan C: I ran in and got a regular sponge (the kind you wash your car with) and started spreading it out. Looked much better, although my foot prints showed, and I was tracking them everywhere. Now I looked like I wandered through a murder scene. Didn’t matter to me, because once I got the hang of applying via a sponge, it was starting to look really awesome. Even though I was a mess. After it felt dry to the touch, I removed the tape. Some of the darker stain seeped under the tape into the “grout” lines, but I just went the next morning and touched it up with the Saltillo (light) stain. Tape still on- and it’s dark outside! I let everything dry for 24 hours, then used Behr Low-Luster Sealer to seal it. I chose the low-luster sealer because we have a pool, and the wet-look would most likely result in wet kids slipping and falling. However, I applied two coats of the sealer, and when I later let my dog out, he skidded on the newly refinished surface! Here is the patio a week later- we love it! Several summers ago, we were swimming in our pool and I noticed a reddish brown stain on the wall in the deep end. I tried to scrub at it, I poked and prodded at it, and couldn’t figure out what it was. My pool serviceperson said “Well, you do need to resurface your pool”. The 28-year-old plaster was crumbling and eventually would get into the pump system, ruining it. That mystery stain? Rebar coming through the plaster and creating a pretty magnificent rust stain. The financial worry felt like a ton of bricks had fallen on my head. How much was this going to cost? Why the heck did I allow myself to buy a house with a pool? Of course, the frugal part of me was wondering if I can do it myself… HA! Nope. Long story short, we just now signed the contract for the resurfacing job to get done. Which led to the inevitable Backyard Makeover Domino Effect. After the initial sticker shock, we began to get super excited- no more decades-old 80’s pool/ pool tile! Maybe we CAN transform this dumpy backyard into an oasis! Maybe we can finally enjoy being OUTSIDE! After cleaning up and getting rid of old backyard crap, we decided to figure out what to do with the concrete pool deck. It is exposed aggregate, which is beneficial because it helps prevent slipping when wet. So whatever we did, it had to maintain that same slip-resistant property. We couldn’t afford for it to be ripped up and replaced, and besides having a few rust stains it was in great condition with little to no cracks. Concrete staining or painting would need to be sealed, which could get slick when wet. I did tons of research and decided to go with a product found at Home Depot, called Behr Granite Grip. It comes in 2 colors, gray and tan that can be tinted to several different shades. We had ours tinted to Copper Marble, and got two big 5 gallon tubs. We chose this product because of the ease and cost. After prepping the concrete, you simply paint it on. I wasn’t sure it would work on exposed aggregate, so I bought a small can and tested it on my side walkway. It worked beautifully! As part of the prep, the concrete needed to be thoroughly cleaned. There were several options I read about online- TSP, muriatic acid (which was pretty frightening to read about- it’s hydrochloric acid), Simple Green, and commercial cleaners and degreasers. The surface must be cleaned, scrubbed, scrubbed, and scrubbed again- otherwise the color won’t adhere properly to the surface, and can cause discolored areas. Moreover, the surface needed to be etched. It took me time to figure out what etching was (finally just googled it- could’ve saved me time if I’d thought of that from the get-go). Etching basically roughs up the surface so the concrete will accept the paint or stain. I sent an inquiry to Behr customer service to see if exposed aggregate needed to be etched since it’s rough to start with. The answer is YES. I finally came across a product at Home Depot from Rustoleum, which is one of my favorite DIY products. It’s a concrete and masonry cleaner and degreaser. It has to be diluted, so follow the directions on the container. As for etching, well, here’s where my newbie-ness comes into play. Rustoleum has a cleaner and degreaser, and also a cleaner and etcher (with added components to rough up the surface at the same time as cleaning it). The containers are almost identical. So I actually ended up cleaning the concrete, then having to clean and etch. Note to all you DIY-ers out there- just get the Clean and Etch. After applying the cleaner/etcher, you have to scrub with a long-handled scrub brush, using about 10 million tons of elbow grease. Trust me- my arms and shoulders were super sore the following few days! Rinse it a MINIMUM of three times, and let it dry. The surface should feel like 150 grit sandpaper. Just keepin’ it real though- I don’t know what 150 grit sandpaper feels like compared to other grit sandpapers, so I just felt it and yup, felt like sandpaper. Done. Just needed to keep the kids and a crazy dog off of it for a day. We did not have any cracks or chips to repair, so if anyone out there has them, you would repair the cracks after the etching. There are a couple products out there from mixing your own concrete (in a small bucket- apply with trowel, putty knife, etc.) or premixed in a sort-of squirt bottle for filling cracks. Let it dry and sand down lumps or ridges. Here’s a few pics of the concrete after cleaning and etching. There were rust stains on the concrete which did not come up. I didn’t worry too much about them because 1) the color we chose is similar to rust-color 2) they were small 3) I was too lazy to go out and buy the recommended Krud Kutter to try to get it up. The next step was to tape off the areas we did not want painted. We used painter’s tape for concrete- which I never knew existed and probably have picked up in the past on accident and ruined an interior wall or two, but whatevs. It adheres well which I needed. We taped around the pool coping and bricks, and covered over the additional copings (is that what they’re called?) and pool deck drain (the horizontal black lines in the picture). We also taped over our current pool fence holes- we had the fence replaced a few years ago and new holes were drilled- the old ones we left uncovered. Now the fun part. Well, not so fun. Keeping two young kids away from wet paint and a wide open pool was not fun OR easy. Not to mention the numerous interruptions we had to break up fights going on inside. Regardless, we started by painting the Granite Grip with brushes alongside the taped areas and borders. This was super exciting- I knew from the first brush stroke I was going to love the color! Then came the rest of the surface. Behr is pretty clear that one must use a 1/4 inch adhesive roller for the Granite Grip. We got a couple long-handled rollers as well. The problem: Not easy to get the first two coats on with a long handled roller on exposed aggregate. More pressure is needed to get the product evenly spread, so we ended up on our hands and knees covering about 800 square feet (just a guess) of rocky, sandpapery, jagged concrete. I’m not bitter. A note about the first coat: The first coat of the Behr Granite Grip is NOT what the final color will look like. Behr is very clear about that. The second and subsequent coats are more accurate. We did 3 coats after the initial border-painting. Also, the surface became smoother after multiple coats. On the last coat, we were able to use the long-handled roller, giving our backs, butts, and quads a break! This product dries fairly quickly- ok to have light foot traffic after 24 hours, can move furniture back after 72. We had to take the dog on walks and despite my neighbor behind me spraying a hose over my fence onto the newly painted surface, it went off without a hitch. Took us about a day to complete (after the surface prep). My name is Amanda. I hate my house. Well, not really. But sort of. I bought my home in 2005 as a newlywed, and thought it was awesome. Ok…it was because of the pool. I wanted a pool. I overlooked the 80’s wallpaper, 80’s linoleum, 80’s carpet, and 80’s dark wood cabinets for as long as I could. I began to feel unhappy in my home. I began cursing whenever I walked into my kitchen or bathroom. But I was stuck- I couldn’t afford professional remodels and couldn’t afford to move. 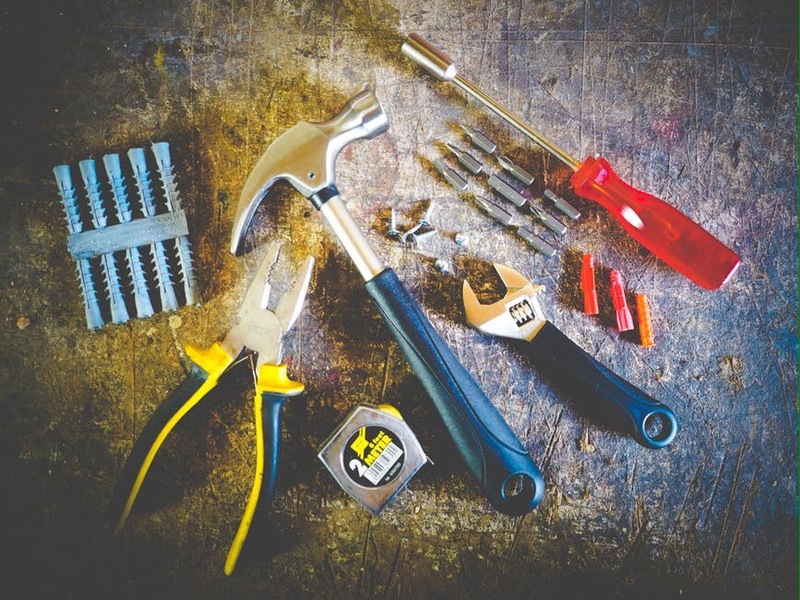 I had been taken advantage of by contractors and repair services in the past and the thought of dealing with the rigamarole of getting estimates, choosing a company, and forking out loads of dough for projects made me cringe. Don’t get me wrong- there are projects I would never attempt on my own. But I finally came to a point where I was sick enough of my house that I bravely decided to step up and take the plunge on the DIY projects I wanted done. So I did what any twenty-first century homeowner would do- I You-Tubed various projects and decided to take the bull by the horns to update my 1988 home. I am by no means creative, but I want others to know that you don’t necessarily need to be creative, a designer, or a handyman to transform your living space. Author ihatemyhouseblogPosted on May 14, 2017 May 21, 2017 Categories DIY, Home, home improvement, RemodelsTags DIY, Home, home improvement, ProjectsLeave a comment on My name is Amanda. I hate my house. Amanda is a full time nurse, wife, mom, cheapskate, and reluctant handyman.